Our original graphic novel series, about a girl and her pet ferret. 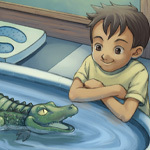 Our how-to book series about drawing anthropomorphic and fantasy animals. Our how-to book about digital coloring. Cover Illustration for MLP #71! 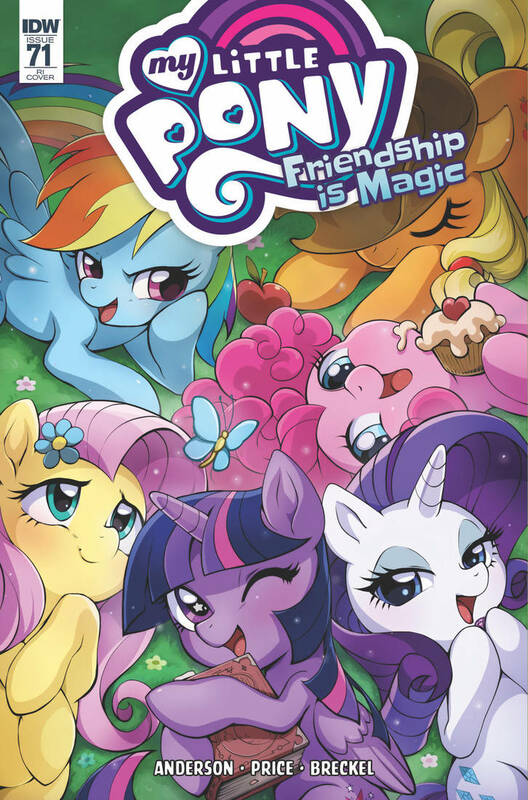 Super excited to share our cover illustration for IDW's My Little Pony: Friendship is Magic comic, Issue #71 (RI variant). Twilight Sparkle enjoys the company of her pony friends on a lazy afternoon, aww! Pencils and colors by Lindsay, inks by Jared! Available through your local comic store! New Book: Little Pony Drawing Book! Our newest how-to draw book is available now, and its all about ponies! 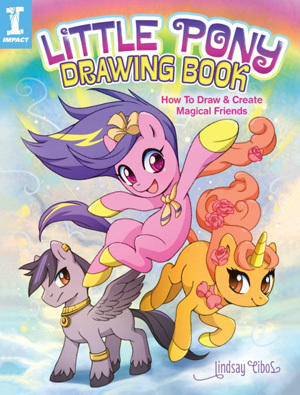 Little Pony Drawing Book: How to Draw and Create Magical Friends is 128 color pages packed full of cute ponies, unicorns, pegasi, other forest friends, with lots of demos to take you step-by-step through the drawing process of building up characters using basic shapes. Plus tips for proportions, poses, motion/action, facial expressions, manes, tails, fashion, and more. So, if you’re ready to jump into the creative saddle to dream up and draw some of these cartoon cuties, you can order signed copies through our online shop. Also available through Amazon and Barnes and Noble, or check Indiebound to purchase at your local bookstore! We also have a couple of coloring books: Little Pony Coloring Book and Little Pony Fashion Coloring book. Check out a bonus pony drawing video tutorial below! 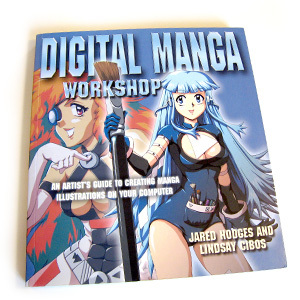 Authors Jared Hodges and Lindsay Cibos are back for their 3rd book to teach you how to draw furries! This anthropomorphic drawing book is packed with 25 step-by-step demonstrations to teach you how to draw the awesome furries of your imagination ranging from slinky scalies to modern day sphinx. 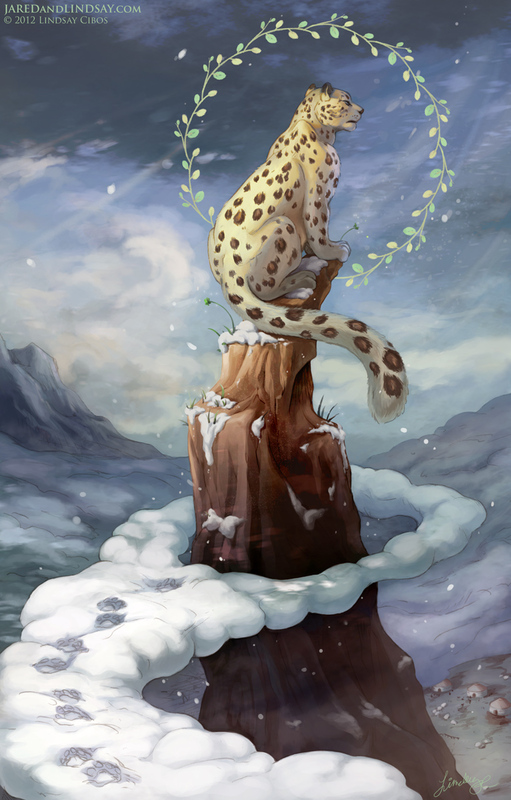 Discover different coloring techniques, learn how to create realistic fur and scales and develop the skills to go about creating your own fursona! 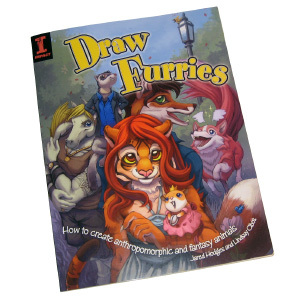 Loaded with a variety of drawing styles and techniques from contributing artists Katie Hofgard (Wolf-nymph), Analon, Kristen Plescow (Centradragon), RUdragon, Tyson Tan, Kathryn Layno (denimcatfish), and Jennifer Lynn Goodpaster Vallet (CookieHana), you’ll easily learn how to create furries from start to finish! 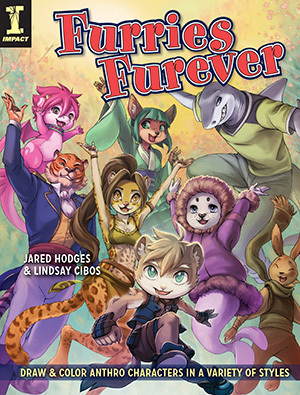 Furries Furever arrives in bookstores August 13th! Available at Amazon and Barnes and Noble, or check Indiebound to purchase at your local bookstore! P.S. 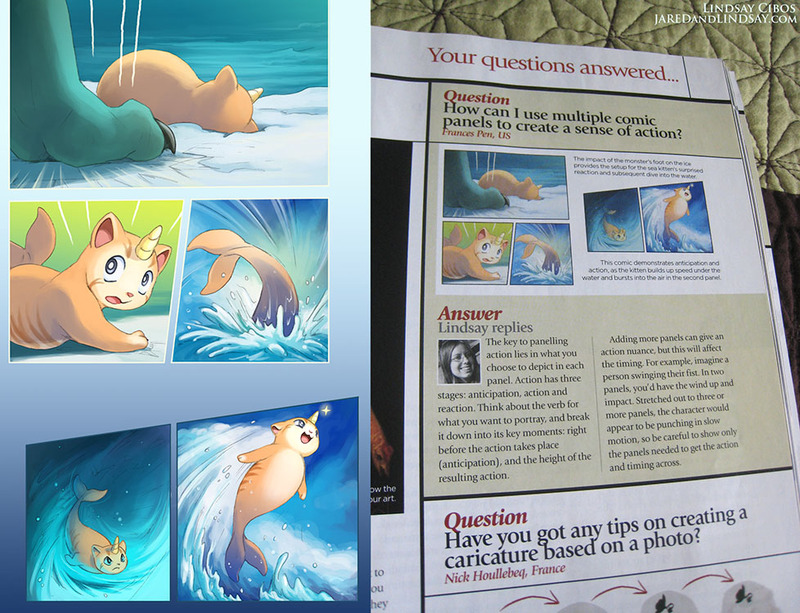 You can watch a step-by-step video of how Lindsay created the Furries Furever cover here! 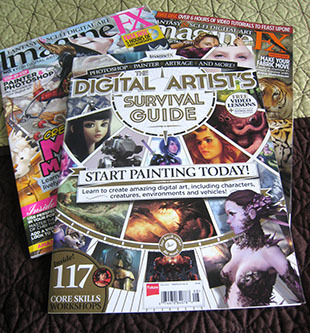 New art in Lindsay's portfolio: illustration and comic tutorials for the May and June 2013 issues of ImagineFX's Fantasy and Sci-Fi Digital Art magazine, and The 2013 Digital Artist's Survival Guide. 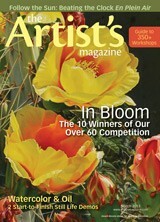 The March 2013 issue of The Artist's Magazine features a selection of Lindsay's animal sketches and thoughts on sketching and keeping a sketchbook. 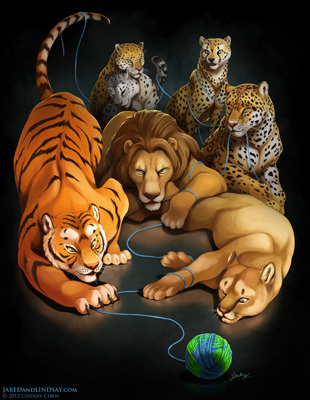 Updated Lindsay's art portfolio with an illustration she did to help promote the efforts of wild cat conservation group, Panthera, published in the November/December 2012 issue of Bare Essentials magazine (see pg 68 for Panthera illustration). New Book - Draw More Furries! Arriving in bookstores November 23rd! The follow-up book to Draw Furries, DMF is packed with more fantastic furries and scalies to draw! This book shows readers how to create anthropomorphic characters (animals with humanlike characteristics) that effectively convey various personalities, combining elements of people with those of furry (or feathered or scaled) animals, reptiles and mythical creatures. Signed copies are available through our online shop! Also available through Amazon and Barnes and Noble, or check Indiebound to purchase at your local bookstore! Updated Lindsay's art portfolio with an illustration she did for the Snow Leopard Trust, published in the September/October 2012 of Bare Essentials magazine. Also check Lindsay's spot illo portfolio for a cute meerkat foursome, created for a graphic designer's logo. Updated Lindsay's art portfolio with an illustration she did for the Vital Ground Foundation, published in the July/August 2012 issue of Bare Essentials magazine. 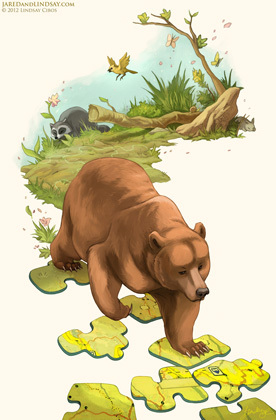 The Vital Ground Foundation helps preserve the threatened grizzly bear, other animals, plants, and natural communities through the conservation of habitat and wildlife linkage areas. 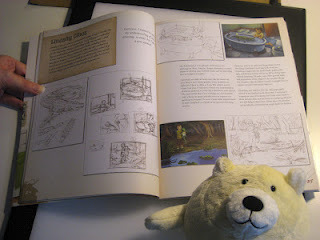 Lindsay also recently wrote to step-by-step drawing tutorials: How to Draw an Arctic Fox, and How to Draw a Polar Bear. 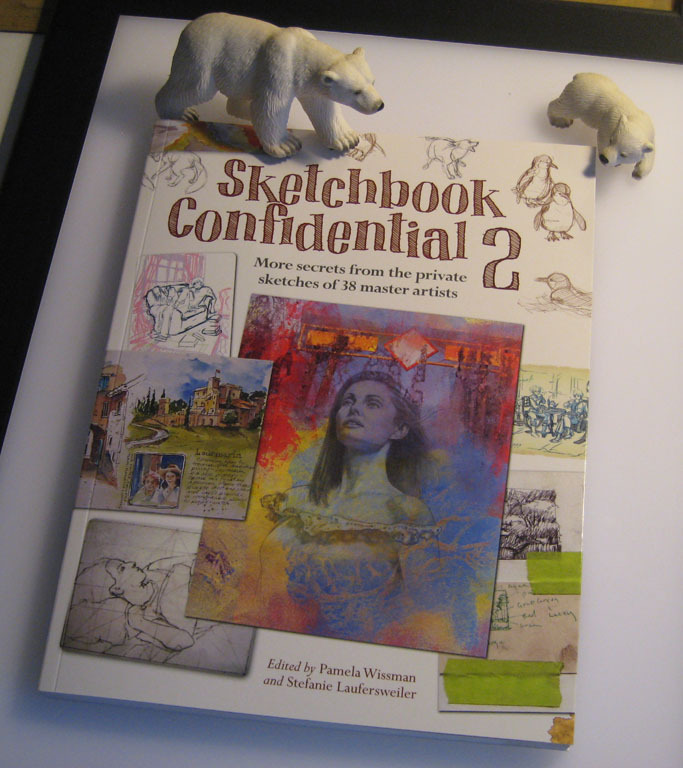 Lindsay Cibos and Jared Hodges are in a new book called Sketchbook Confidential 2, published by North Light Books. This fascinating art reference book takes a peek into the sketchbooks of 38 different illustrators, fine artists, and painters. Each artist is showcased with several pages of WIP sketches, and their thoughts on sketching. Give it a flip through next time you’re at the bookstore. Also available through Amazon and Barnes and Noble. Check out Lindsay's blog for more sample pages from the book! Lindsay Cibos has teamed up with Wildlife Warriors, an organization for wildlife conservation and awareness, to host a comic competition for kids and teens to inspire creativity and help promote polar bear research and preservation of the species. Open to contestants internationally within three age categories – eight and under, nine to thirteen, fourteen to eighteen, entrants are invited to submit a one-page comic inspired by Arctic wildlife! The winner will receive a character cameo in a Last of the Polar Bears side-story, an original illustration by Lindsay, The Last of the Polar Bears Pre-Dawn book, and a Polar Bears International bear adoption kit! Click here for more competition details! You can also read the "Creating a Comic" tutorial by Lindsay in the May/June 2012 issue of Bare Essentials (pgs 37-41). The storyboards for all of The Last of the Polar Bears are finished! Check out that giant stack of paper! 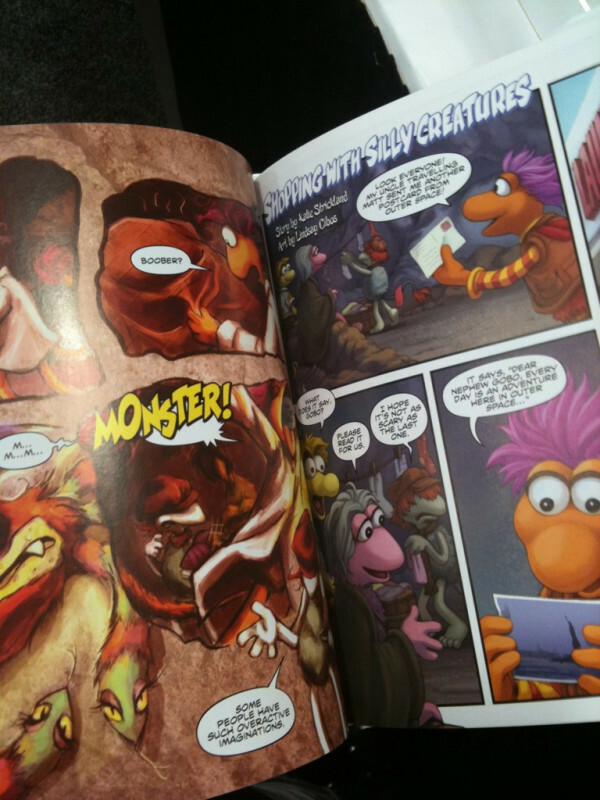 The Fraggle Rock: Tails and Tales graphic novel is now in bookstores! The anthology includes a comic and back cover illustration drawn and colored by Lindsay Cibos. 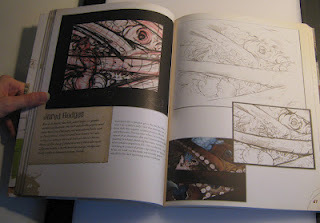 Hardcover, 128 full color pages. For readers of all ages. Available through Amazon and Barnes and Noble, or check Indiebound to purchase at your local bookstore! Also check out the interview Lindsay did with Muppets' fansite Tough Pigs here! Lindsay's portfolio has been updated with new illustration and comic samples, including a cover illustration for the Fraggle Rock comic series. Keep an eye out at your local comic book shop for the upcoming Fraggle Rock Vol.2 Issue 3, due out in March -- Lindsay contributed a cover illustration (Cover B) and a short comic for the issue! The comic and cover will also be available in a hardcover collected trade later this year. 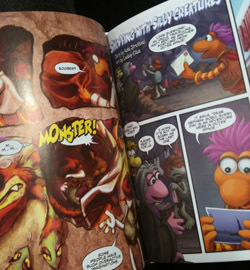 You can read about the coloring process of making the Fraggles cover here. Check it out - the Archie characters Veronica, Betty, Archie and Jughead, as penciled by Lindsay, inked by Jared! The pencils can be viewed in Lindsay's Portfolio under Characters, while the inks are in Jared's Portfolio under Black and White Illustrations. I've started posting pages of The Last of the Polar Bears online as a webcomic. I'll be posting pages, as well as write about the process of making comics, as time allows. You can read The Last of the Polar Bears comic here: www.lastpolarbears.com. Jared and I will be speaking at the 5th Annual Greater Rochester Teen Book Festival on Saturday, May 15, 2010 9:00am-5:00pm. Click here to go to their website for more details. If you're planning on being in Rochester, NY on that day, please come by and see us! Admission to the event is free, and they have a great lineup of authors. We'll be doing several talks about creating graphic novels during the day, as well as a book signing. 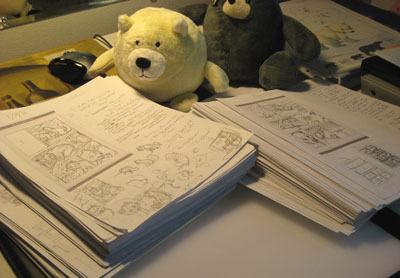 The Last of the Polar Bears is our next graphic novel project. We've spent the last six months writing and developing the groundwork for it. 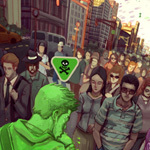 Now, as the story moves towards production, we're ready to unveil the characters and a glimpse of their story. Check out Lindsay's portfolio for new Last of the Polar Bear illustrations, comic pages, and character sheets. New Book - Draw Furries! I'm proud to announce Draw Furries - How to Create Anthropomorphic and Fantasy Animals, a new how-to draw book written and illustrated by me and Jared Hodges! 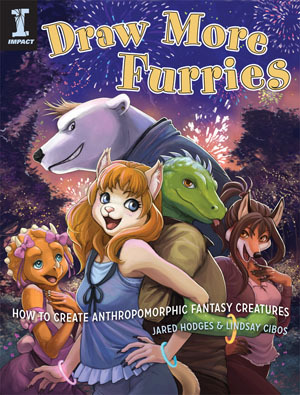 Draw Furries - How to Create Anthropomorphic and Fantasy Animals is now available in bookstores! 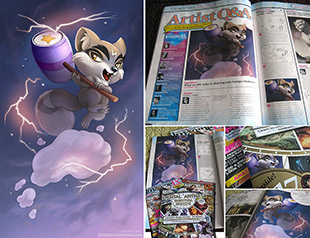 It's 128 full-color pages packed full of tips about drawing anthropomorphic characters and animals! Step-by-step anatomy, poses, and species-specific details (wings, tails, eyes, fur, feathers, claws, etc.!) for feline, canine, equine, rodent and avian characters, plus coloring and backgrounds! 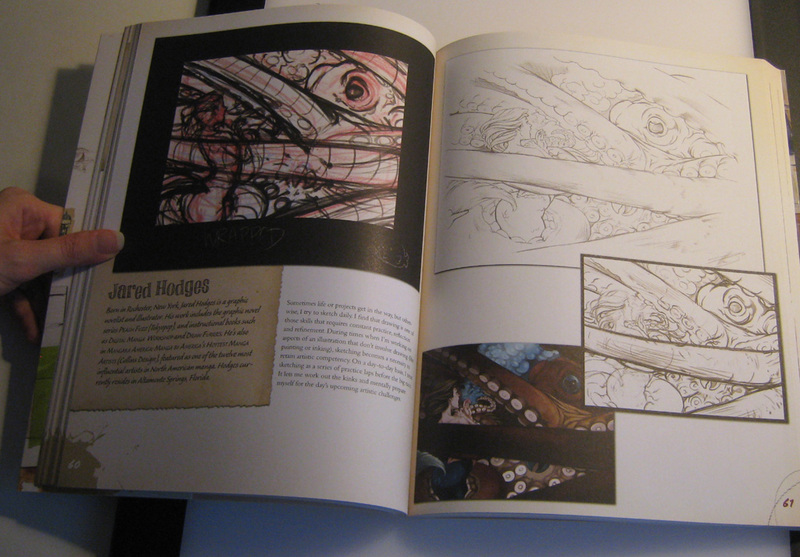 A couple of sample pages from the book can be viewed in our tutorial section. If you'd like to get the book signed by Jared and me, we have copies available in our online store. It's also available through Amazon and Barnes and Noble, or check Indiebound to purchase at your local bookstore! 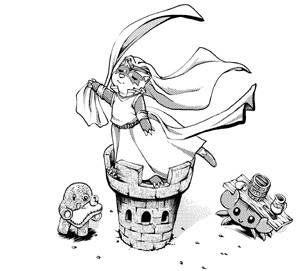 Domo: The Manga is out! That's right, Peach! Domo's here!! The Domo book is now available in bookstores! It's a full color, all-ages graphic novel published by Tokyopop involving that lovable brown monster guy with the big mouth! Two chapters in the book were done by Jared and Lindsay (lineart and lettering = Lindsay, colors = Jared). Check out our comics section for sample pages.